The Lady Tigers jump to their feet to cheer Anna Bell for taking a charge at a key moment down the stretch. 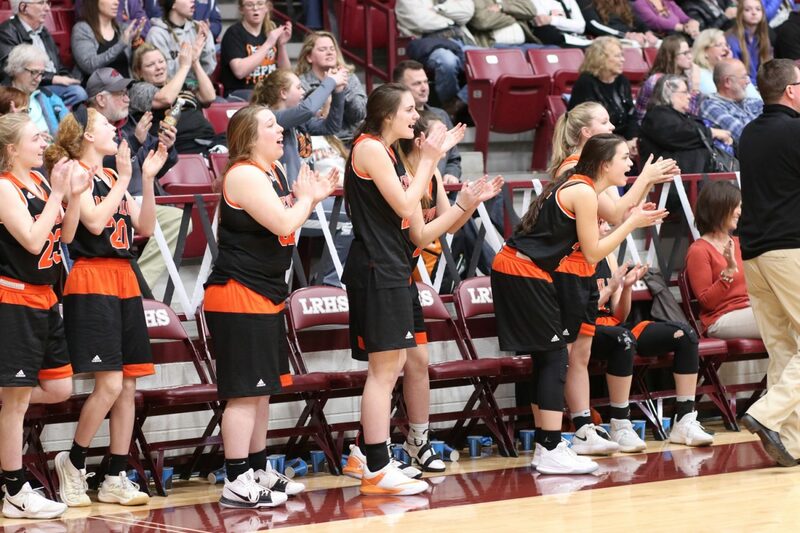 Despite facing double-digit deficits on two separate occasions, the Lady Tigers refused to give up in their regular-season finale at Rogersville Thursday night. Republic climbed out of an 11-point hole in the final 10 minutes of the game to beat Rogersville 57-52. Halli Bartelsmeyer led Republic with 19 points, nine of them in the fourth quarter. Republic scored only four points in the first eight minutes, and for a while, it looked like the Lady Wildcats would run away with it. At one point in the second quarter, Rogersville led by 13, 21-8. But the Lady Tigers closed out the half with a 16-3 run to tie the game at 24 going into the break. Early in the third quarter, Republic briefly took its first lead of the game, 29-28. But Rogersville responded with 12 consecutive points of its own to stretch the lead to double digits once again. But Coach Kris Flood says he wasn’t worried that his players have expended all their energy to erase their first deficit. Instead of folding when they trailed 40-29, Republic outscored Rogersville 11-4 over the next few minutes. The lead was three for the Lady Wildcats when Sydney Dunavant stole the ball with 2:39 remaining and appeared to have an easy layup ahead of her. But Republic’s Anna Bell got back on defense to draw a charge, keeping the Republic deficit at three points and fouling Dunavant out of the game. “She’s extremely smart on defense as far as rotating and being in the right spot,” Flood says of Bell. “There was no doubt in my mind it was a charge. “I thought everybody contributed. Morgan had some hustle plays. Brylee had some really gutsy baskets when we needed it. Avy had some baskets when we needed it. This was a good team effort,” Flood says. Manes also scored in double figures, finishing with 15 points and three three-pointers, all in the first half. Her early shooting helped keep the game close to set up the comeback in the fourth quarter. Powell-Qualo scored 10. From the point that Dunavant fouled out, Republic outscored Rogersville 11-3 to seal the comeback and close out the regular season on a winning note. The victory ended a two-game losing streak for Republic as they head into districts next Monday at Neosho. Republic wraps up the regular season with a 14-11 record. The JV Lady Tigers blew out Rogersville earlier in the evening, finishing up a perfect season at 23-0. Halli Bartelsmeyer made three three-pointers in the second half and scored nine of her team-high 19 points in the fourth quarter to lead Republic’s final charge. Her fourth quarter included a six-for-six performance from the free throw line, and she was our Farr Better Player of the Game.